Since embarrassing Milan and infuriating their fans by refusing to sign a contract extension with the club, 18-year-old goalkeeper Gianluigi Donnarumma has been the subject of intense scrutiny. Scrutiny that followed him to Poland, where he’s currently representing Italy in the U-21 European Championship. 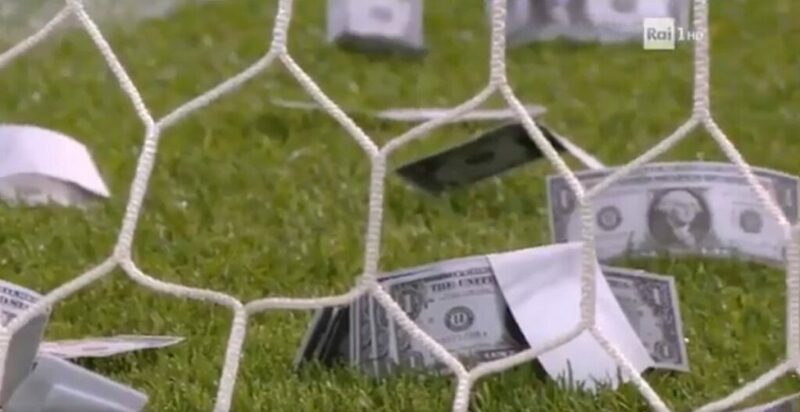 During Italy’s opening match against Denmark, fans hung a “Dollarumma” sign behind Donnarumma’s goal and threw fake dollar bills at him during the first half. Donnarumma didn’t let the localized fake money storm distract him, though. He kept a clean sheet as Italy beat Denmark 2-0. “The situation had become too violent and hostile, so there was no way out,” Raiola said as he spoke to Sky Sport Italia , Mediaset Premium and Rai Sport. “We took a decision that we didn’t want to take. “It was nothing to do with money. We were threatened. Donnarumma’s family was threatened, both with not playing anymore and threatened with death. You can’t keep a player by threatening him. “Now there is a genuine risk he could miss a year [after Milan threatened to bench him next season]. His quality makes that improbable, but this is already on the verge of bullying. “The situation had become too violent and hostile, so there was no way out,” Raiola said as he spoke to Sky Sport Italia , Mediaset Premium and Rai Sport . “We took a decision that we didn’t want to take. “Now there is a genuine risk he could miss a year. His quality makes that improbable, but this is already on the verge of bullying. “We never even got to talk about money or release clauses, because we were not allowed to get that far, nor to think of what was best for Gigio. So in Raiola’s version of events, Milan (and/or their fans) threatened Donnarumma’s life while he was ready to sign a new contract. Because that makes total sense. At this point, it might be best for everyone if Donnarumma signs with a club far away from Milan (and definitely not Juventus). If this animosity drags on all season, it’s not going to be good for anyone.